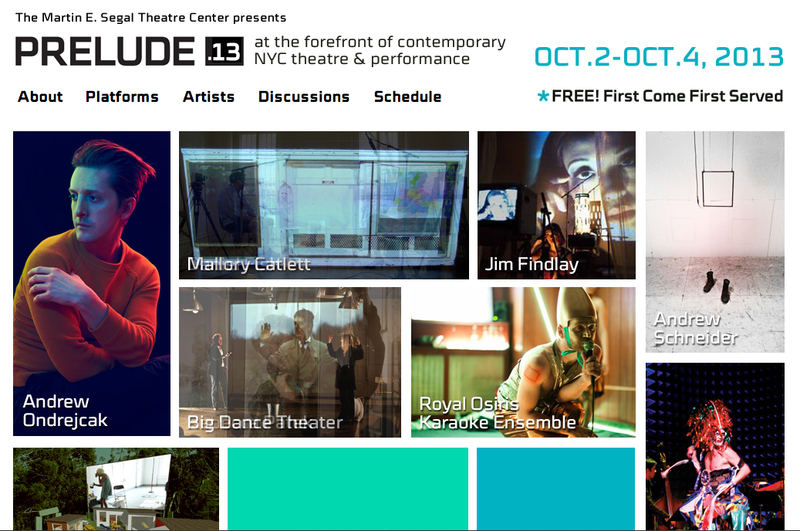 From 2007 – 2009 I co-curated and produced the PRELUDE Festival, an annual snapshot of artists at the forefront of contemporary New York City theater and performance. Artists, audiences and academics gather for a free program of in-process presentations, open rehearsals, and discussions to gain insight into process and survey of the current New York moment. Meant to bridge the worlds of academia, practice and general audiences, we transformed PRELUDE from an informal symposium into a major event of the NYC contemporary theater season, introducing a festival catalogue with contextual writing, hiring a festival dramaturg and introducing curatorial framework. During my tenure the festival grew significantly in scope, attendance and profile. Artists presented and/or commissioned include: Marina Abramovic, John Jesurun, David Levine, The Bruce High Quality Foundation, Jay Scheib, Richard Maxwell/NYC Players, The Living Theater, Branden Jacobs-Jenkins, Radiohole, Kristen Kosmas, Richard Foreman, The Builders Association, Sheila Callaghan, Banana Bag & Bodice, National Theater of the United States of America, Jenny Schwartz, Big Dance Theater, Toshiki Okada, The Debate Society, John Moran.